About 3500 people took the streets in Hamburg, Germany last night to protest against the G 20. The demonstration was one of many actions this month to mobilise for actions against the G 20 summit which will take place in July. The protests started during a soccer game of St. Pauli. In the stadium fans of the club were dropping banners with texts like “G20 To Hell!” After the game a demonstration with about 3500 people started at the stadium. Riot cops briefly stopped the demonstration, according to the cops because fireworks were thrown, but the demonstration could continue after the short stop. Activists had expected about 1000 people at the demonstration, but many more people came to the demo. The demonstration was accompanied by many riot cops, who “protected” the venue where the G 20 summit will take place. On Monday the protests will continue. 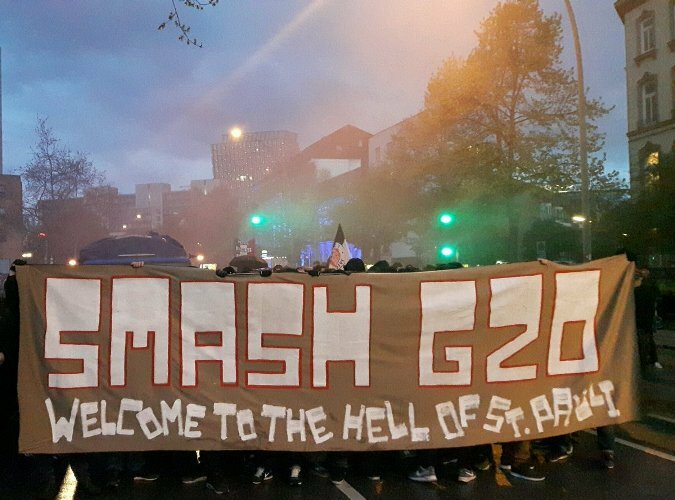 The upcoming G 20 summit is one of the main issues at this years Mayday demonstrations in Germany. The G 20 summit in July will take place about 1 kilometer from the stadium in Hamburg. Police authorities are planning a ban zone for demonstrations in the city center of Hamburg during the G 20 summit. The repressive approach of police authorities triggered an angry reaction of many activists. This month Germany saw many attacks and demonstrations against capitalism, state infrastructure and the G 20 summit . Ban or no ban: the mobilisation against the G 20 summit continues. Previous post: Against Non-Life: Communization or Misery!